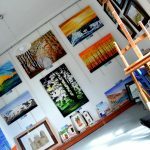 For all who want to see art all the time we have Permanent Art Points and so you can have a look all the summer and winter. 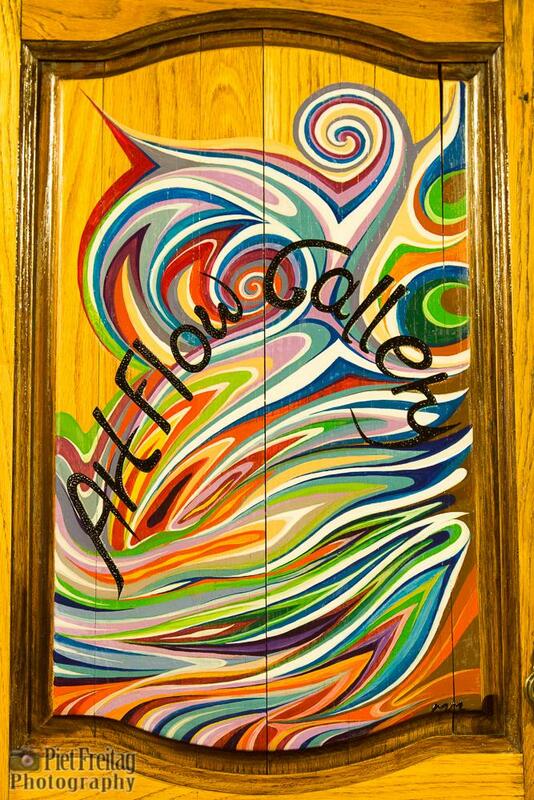 In 2018 we have two more Permanent Art Points, so go around and look at the work of our artists. 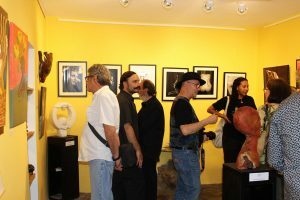 In May 2017 opened Claudia Boldura a new gallery in Paleochora. Claudia Boldora is italian artist and makes different form of art. 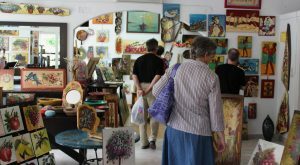 In the Flow Art Gallery, in the center of Paleochora, she wants to show her own art but also art of different artists. So there will be a lot of different exhibitions during the summer. Claudia doesn’t believe in „high“ or „low“ art, just in art. Art is for her an expression of emotions of human beings and she wants to start a conversation with everybody about creativity which is inside of people. 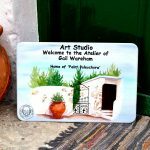 Gail Wareham is a British artist & tutor who now lives and works permanently in Paleochora, running art courses & workshops for visitors. 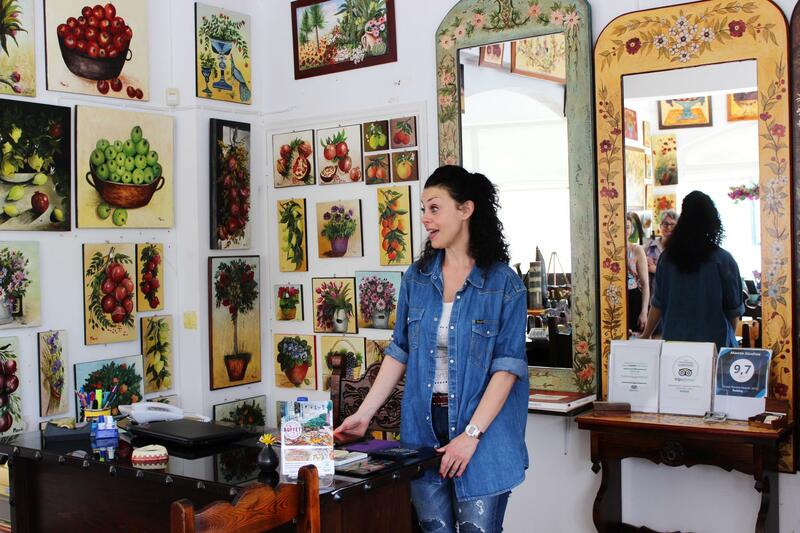 You can visit her studio in the village of Azogires, where her own artwork is on display for your enjoyment. The village of Azogires is the home of The Monastery of the 99 Holy Fathers, Caves that you can enter and explore, mountain walks to other surrounding villages, and the picturesque waterfall where you can take a cooling dip in the summer. 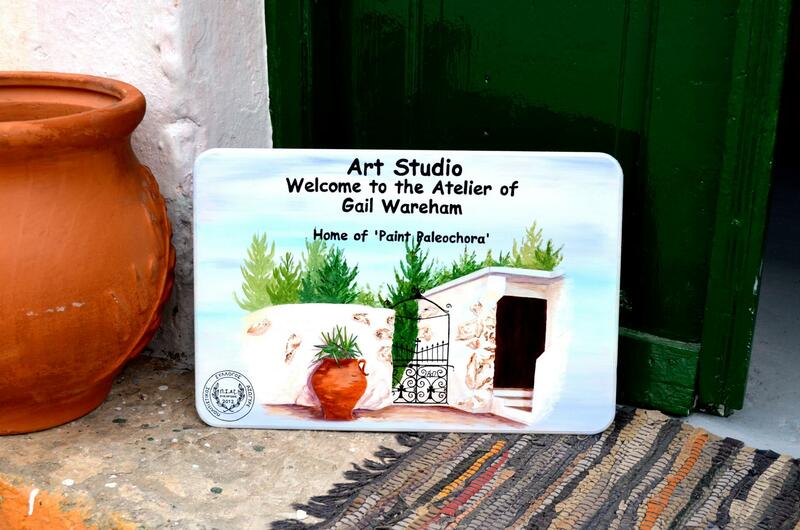 You can contact Gail direct via email to paintpaleochora@hotmail.com, by calling 0030 694 346 3920, or by visiting her websites www.gailwareham.com & www.paintpaleochora.com. 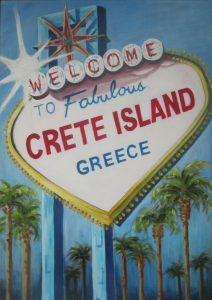 Gerhard Stelzhammer is born in Graz and since 2009 he lives and works on the island of Crete in Paleochora. His creations are marble, alabasta or as of late, wood. As an artist it was his dream to present art in nature and so he realized this in 2012 with his Sculpture Garden in Kondoura. 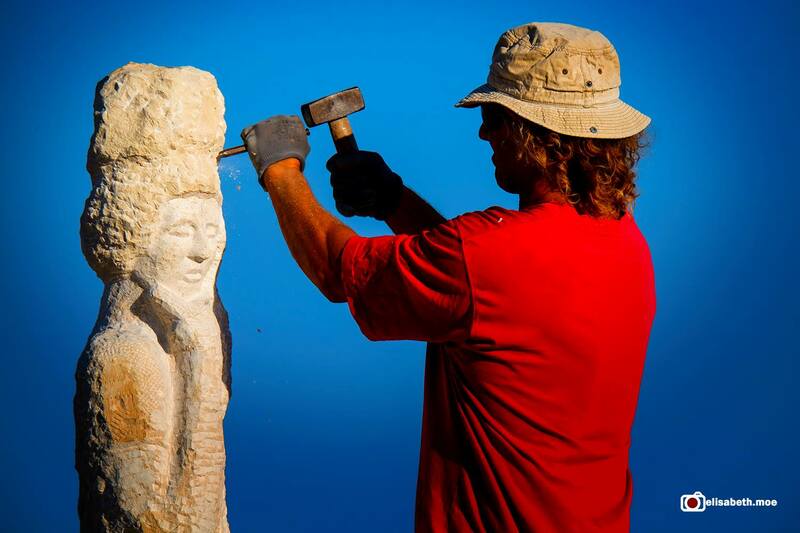 In 2012 he created a sculpture garden in Kondoura. After moving to Anidri in 2017 he will officially open a new sculpture garden in the beginning of June 2018. 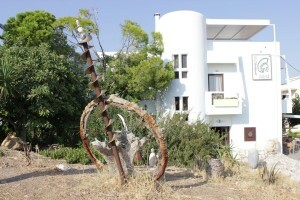 Under old olive trees you will see his sculptures in a more nicer atmosphere. He offers also workshops for wood or stone. 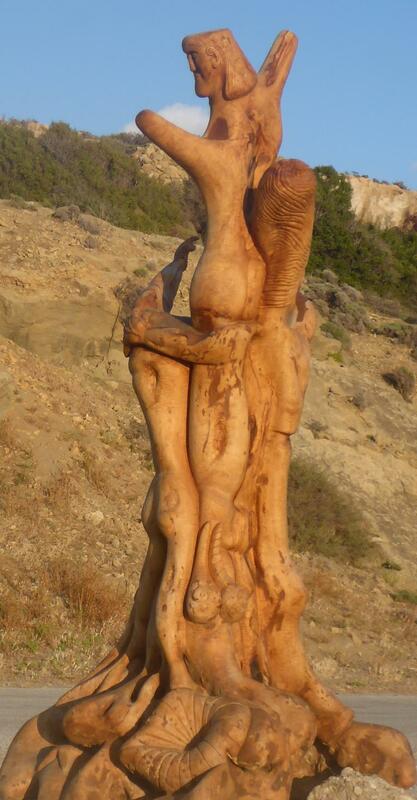 Kostas Liatakis is born in Paleochora and makes art out of stones, woods and things he finds in the nature. You find his artwork a t Aris Hotel and at his Workshop. In the centre of Paleochora town, you will find the Workshop of Kostas Liatakis. 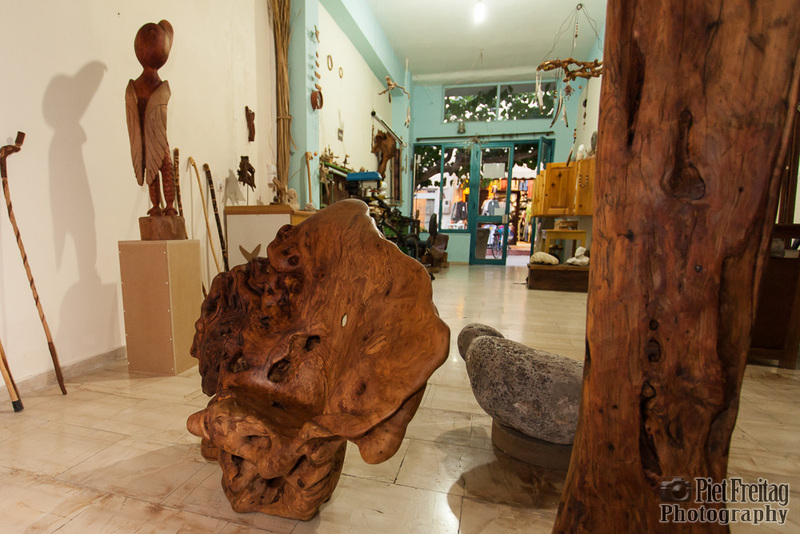 Kostas specialises in sculpture from Wood, sandstone, driftwood & marble. 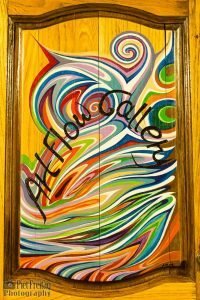 His workshop is full of his own creations and you will also find him here working on his latest pieces. The workshop is located in the street that runs behind the Main Street (just a few doors from the Fruit & Veg shop). 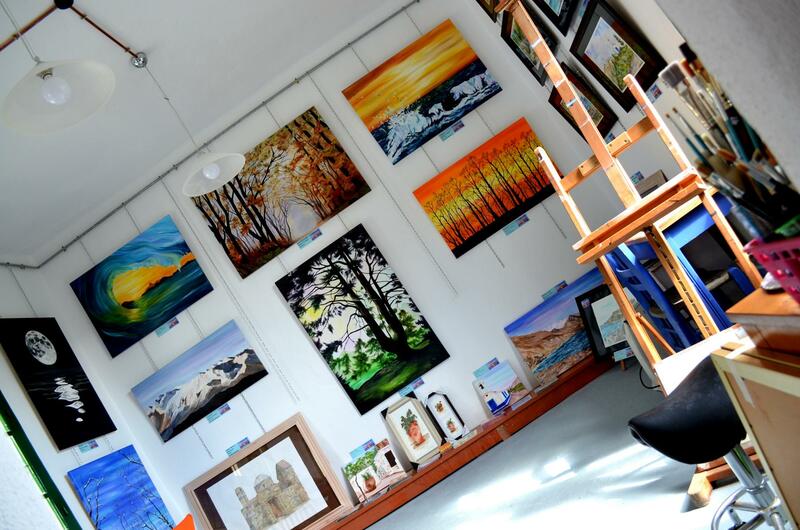 Call in to see him, for a big welcome & lots of special artwork. Kosta create a new sculpture out of olive tree, the ΑΝΑΔΥΣΙΣ. He was working several months to finish this sculptur in May 2018. If you see it, you need a while to discover all what he had made. One woman describes Kosta as the little prince in the book who help us to see things inside the trees. The place of the new sculpture is on the top of the sandy beach side, between the stony donkey at the harbor. Linda is a british artist & filmmaker and is the resident artist at Finikas | Palm Tree Restaurant in Paleochora. 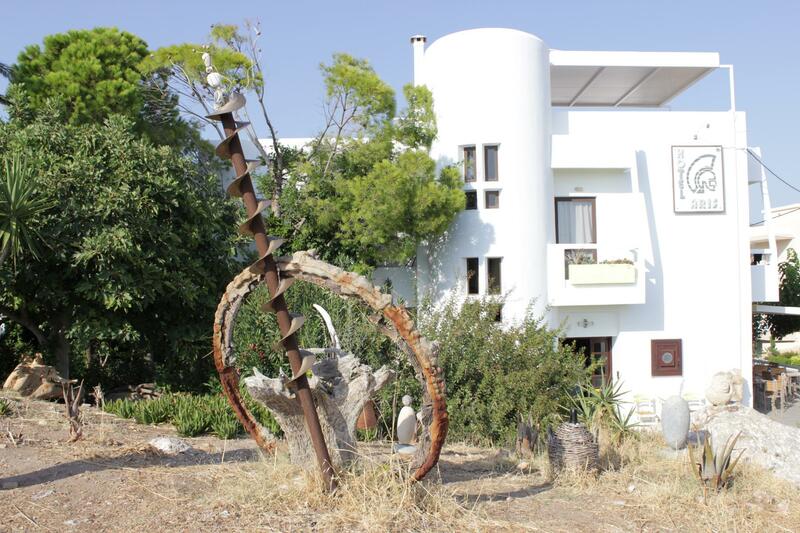 Her art can be bound from 8th of May until 1st November 2018 on the walls surrounding the outdoor terrace at Finikas near the Sandy Beach. Accepted to The Glasgow School of Art at the age of seventeen, Linda went on to enjoy a multi varied career in the arts. With her roots firmly in the fine art disciplines of drawing & painting, her work also extends to music, film & TV in the role of writer, director, producer & actor. 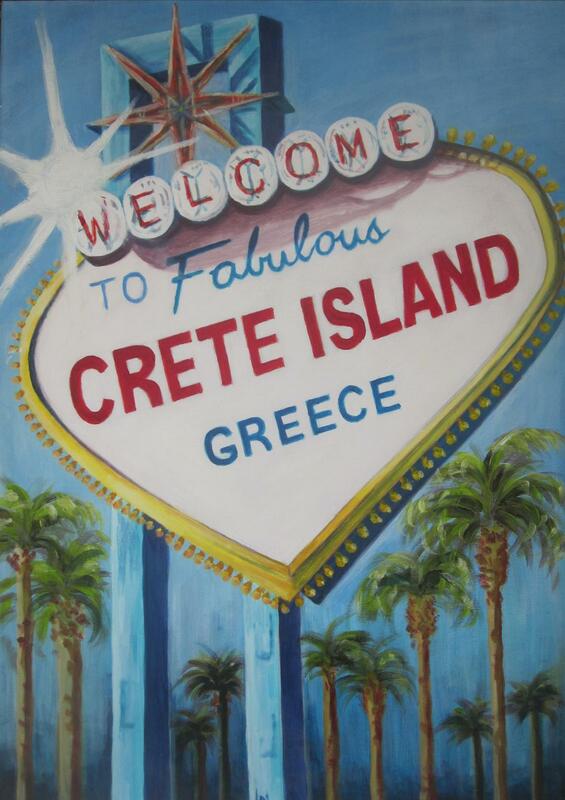 Extensively travelled, Linda has regularly conducted international solo exhibitions including Spain, Greece, Cyprus, New Zealand and the UK with many of her original works transferring into private collections. While abstract painting is her first love, Linda still applies her craft to figurative, representational and design work. If you interested in the filmmaker Linda Mc Guire you can see her short film „Heavenly Time“ (2017) every Monday & Thursday evening throughout the summer season at the Pearl Cavo venue (opposite Paleochora Camping) 8:30 pm. Manto is a local painter. 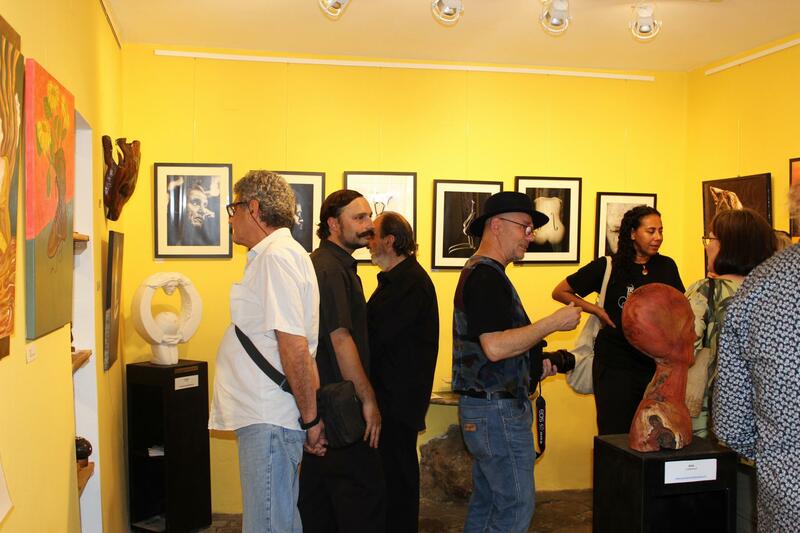 She studied art and design in Athen and opened her Art Gallery in Paleochora in 2003. The whole gallery is full of paintings of Manto. 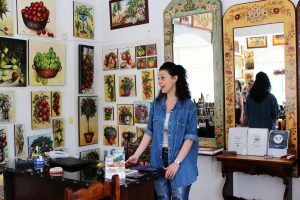 She likes the traditional paintings from the objects and also the technique of her painting. 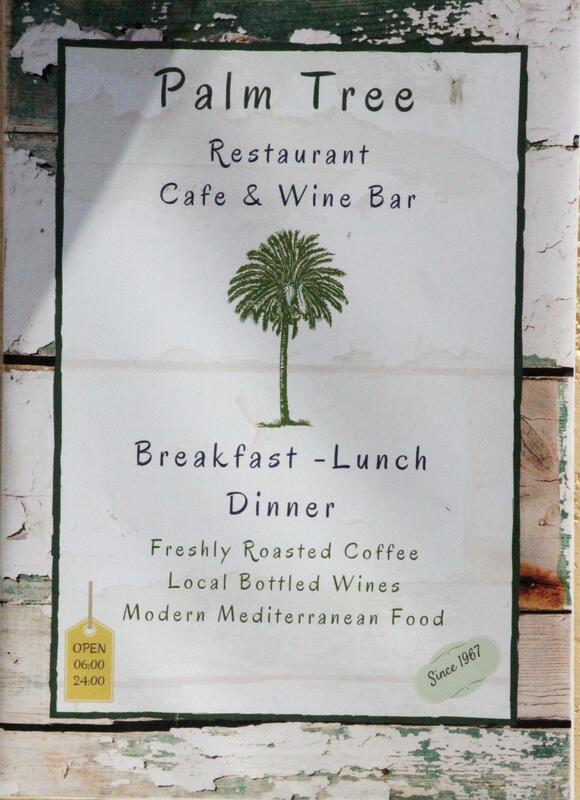 You find frescos, paintings on wood, icons and minoan based paintings. The Gallery is open from 9 am – 2pm and from 6 pm – 9 pm.